BPMN is not for modern work. BPMN worked when everyone was in a factory in the 18th century. These days, most workers are team workers – which explains the gigantic explosion of communication and collaboration tools in the workplace. People want something that’s structured, but less rigorous. If you pay someone a six-digit salary – do you expect them to follow flowcharts? BPMN cannot deal with every possible scenario. 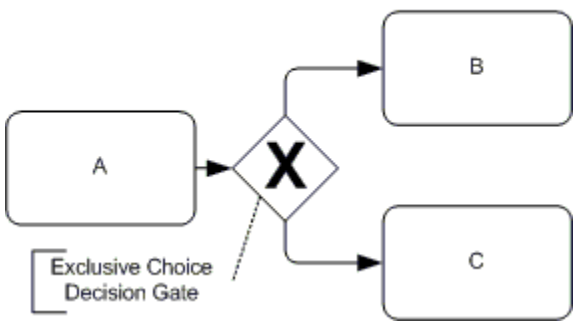 With BPMN it’s hard to deal with every possible exception/deviation from the “normal way”. With Tallyfy – you can use comments and report issues – to cater for scenarios which nobody anticipated before. BPMN is not for modern devices and systems. If you’re using BPMN to publish process maps – it became obsolete when smartphones came out. Nobody is going to refer to a large, complicated diagram that could barely fit on an A2-size sheet of paper, let alone a 6-inch phone screen. BPMN solves process documentation – not process improvement. If you want to go from as-is into a to-be process situation, you need think practically. How can you make change, training and improvement in a process easy? Also – how can you involve the people who actually do the process to improve it? BPMN requires re-doing a process model, just to make a small change – which is often just for people who know BPMN. Tallyfy has built the simplest solution imaginable for getting real-time process feedback from the field. BPMN cannot be exposed to your client. No customer or client wants to see your complex, beautiful BPMN diagram. Customers care about a better customer experience. Tallyfy focuses on making processes so easy – that you can even share your process with your customer. 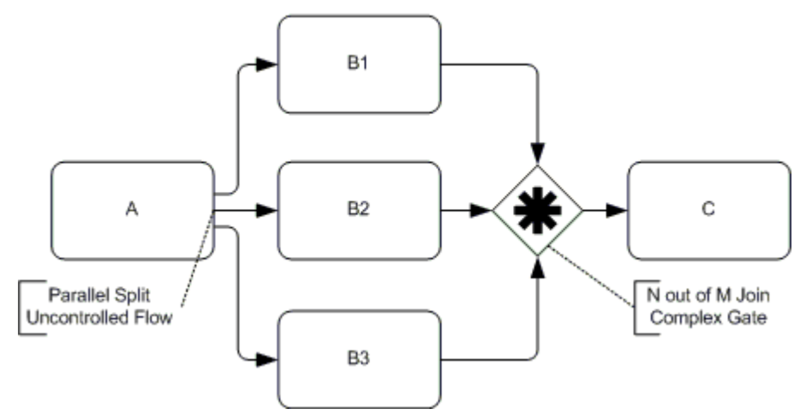 In contrast – BPMN is mostly focused on automating internal, repeatable processes. 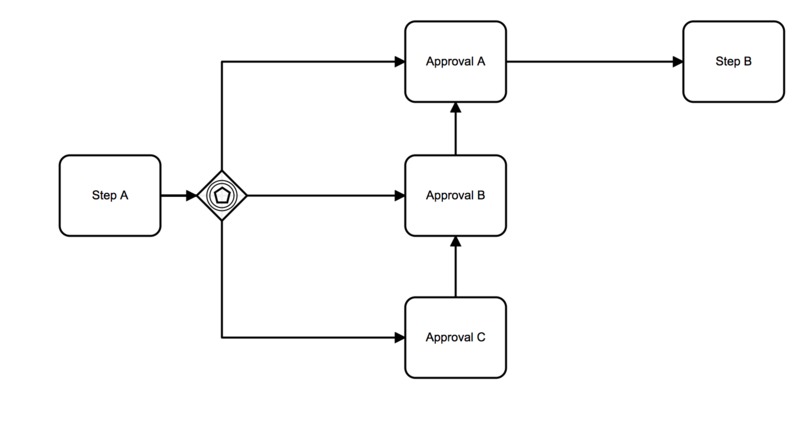 BPMN does not make following a process easy. 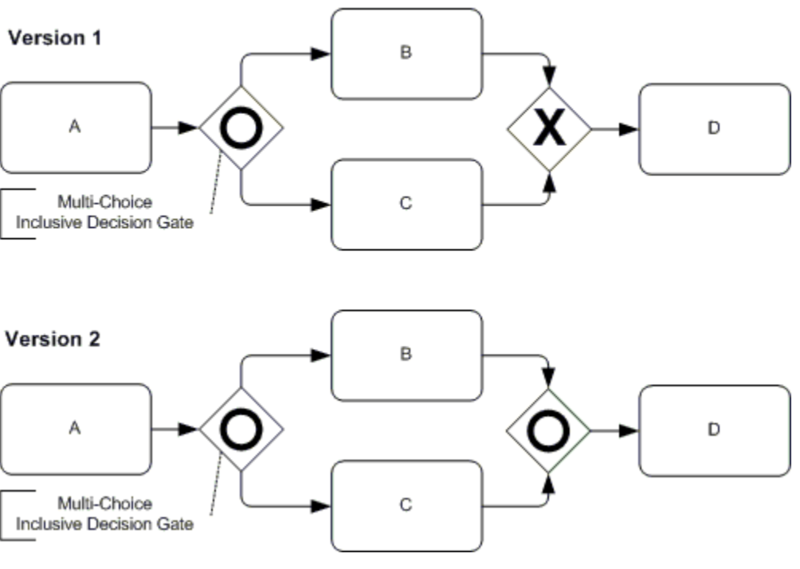 BPMN, while being formal and proper – does not solve the actual problem at work. The reason you map a process is so that people can follow it easily. BPMN is really for documentation. Real-life is usually totally different. 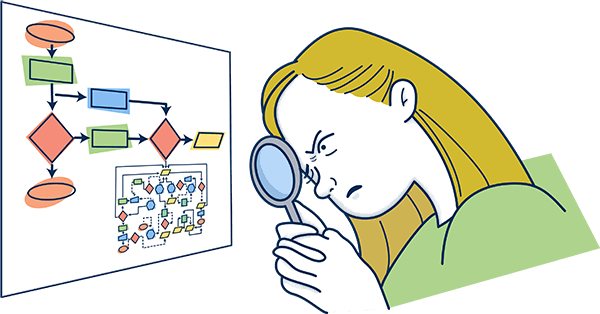 Why invest in mapping via BPMN – when you know nobody will follow the process in real-life? BPMN is not really a standard. Although it’s supposed to be a standard – many vendors create their own “flavor” of BPMN making migration between vendors a non-trivial task. If you already use BPMN or are familiar with it – this guide was for you. Tallyfy is the new way to map, track and improve processes. It’s built for anyone (including clients) – not just for process improvement professionals, IT staff or business analysts. 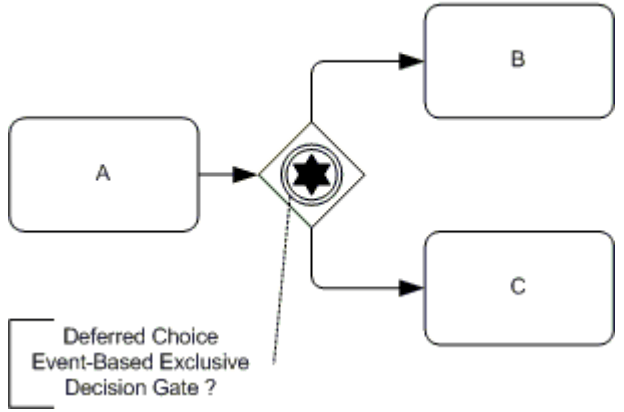 This articles defines known/common patterns in BPMN from legacy BPM tools. For each BPMN pattern, we’ve defined a Tallyfy equivalent that’s fit for modern work. Task A, B, and C are completed in order. Once task A is completed, show task B. Once task B is completed, show/assign task C.
After task A is completed, tasks B and C are to be completed concurrently. (V1) B and C are to be completed together. (V2) B and C are to be completed. Once task A is completed, show/assign task B and C.
After task A and B are completed, task C/D is to be completed. (V1) once both A and B are completed together; (V2) once A and B are both independently completed. Once task A and B are completed, show/assign task C/D. Depending on information gathered in task A, either task B or C is to be completed. If task A contains information X, task B is to be completed. If task A does not contain X, task C is to be completed. After task A and B are completed, task C is to be completed. (V2) Task C can only be started once both A and B are completed. (V1) Once task A and B are completed, show task C. (V2) Once A or B is completed show C.
A decision made in task A leads to either task B or C.
(V1) If task A contains B, show task B. If task A contains C, show task C. (V2) A choice of either B or C is given in A. If B is selected show task B; if C is selected, show task C.
After task A is completed, tasks B and C are to be completed, after which task D is to be completed. After task A is completed, show tasks B and C. After task B or C is completed, show task D.
After task A is completed, tasks B1, B2, and B3 are to be completed. When either of the B tasks are completed, task C is to be completed. After task A is completed, show tasks B1, B2, and B3. After task B1, B2, or B3 is completed, show task C.
Note on issue – This would more easily work in Tallyfy if there was the ability to create two rules for one task: (when A is completed, show task B1. If task B2 or B3 is completed, hide task B1). We’re working on it. After task A is completed, tasks B and C are to be completed. When B or C is completed, task D is to be completed. (V2) B and/or C.
After task A is completed, show tasks B and C. After task B or C is completed, show task D and (V1) hide the other of B or C.
After A is completed, depending on outcome of event, B or C will be completed. After task A is completed, assign task X. If task X response contains answer B, open task B. If task X response contains answer C, open task C.
After A is completed, depending on outcome of event, B or C will be completed. After both B and C are completed, a choice is made between E and D. If E is selected, E is completed, then D. If D is selected, D is completed, then E. After D (after E) is completed, F is completed. After E (after D) is completed, G is completed. After both F and G are completed, H is completed. After task A is completed, assign task X. If task X response contains answer B, open task B. If task X response contains answer C, open task C. After Tasks B and C are complete, open tasks D and E. When tasks D and E are complete, open tasks F and G. When tasks F and G are complete, open task H.
Note on issue. This does not completely replicate the diagram. To do that, you would need to be able to split a process into two processes, yet be able to have rules that make what happens in process one dependent on process two. We’re working on it. Event in Step A has results 1, 2, and 3. If event results in 1, Approval A is needed before proceeding to Step B. If event results in 2, both Approvals A and B are needed before proceeding to Step B. If event results in 3, Approval C is needed in addition to A and B before proceeding to Step B. When Step A is completed, open task Approval A. If step A contains 2 or step A contains 3, open task Approval B. If step A contains 3, open Approval C.